The new head coach of St. Joseph's University joined Dei to talk about his new position and his thoughts on the Sixers heading into the playoffs. Dei Lynam spoke about all the latest with the Sixers as they head into the playoffs. Joe Staszak discusses the early Phillies success, the concerns surrounding the Sixers and breaks down an article surrounding the Green Bay Packers turmoil. 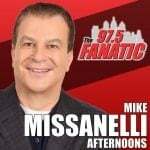 Kevin Negandhi joined Joe Staszak to discuss the national view of the Sixers, the Phillies hot start and the Eagles acquisition of Jordan Howard. Keith Pompey joined Joe Staszak to discuss the Sixers' recent struggles, tonight's game against the Bulls, and which players give the Sixers the biggest matchup problems in the playoffs. Tom McCarthy joined Joe Staszak to discuss the Phillies hot start, as the team is averaging more than eight runs per game. He also touched on the bullpen's early struggles, and two key free agents who are still on the market. Rob is back after being away for a month. He reacts to the Sixers losing streak, and the Phillies early success, asking if Bryce Harper is already good enough to earn Chase Utley's old moniker, "The Man." Dei spoke with Gregg Murphy about the Phils, also to the high school coach of Jonah Bolden. And Finally she spoke with Coach Jim Lynam about the Sixers playoffs hopes and expectations. Jamie is flying high with the Phillies fun 2-0 start to the season as he talks about the change in atmosphere at the ballpark, and the players reaction to the fans. Also who is the biggest threat to the Sixers in the East? Listen here! Jason Myrtetus is back with another edition of Flyers Weekly. He is joined by Chris Therien and Bill Meltzer. What's next for the Flyers? The guys discuss this topic and more!